Nike VaporKnit technology combines lightweight cooling, reduced cling and precision fit. A club crest and side tape in PSG third colors show your team pride. Slim fit looks and feels performance ready. Raglan sleeves let your arms move freely..
Our Jumpman Paris Saint-Germain Authentic Third Jersey 2018-2019 is the same jersey players wear on the field. It brings together two of the biggest brands together. 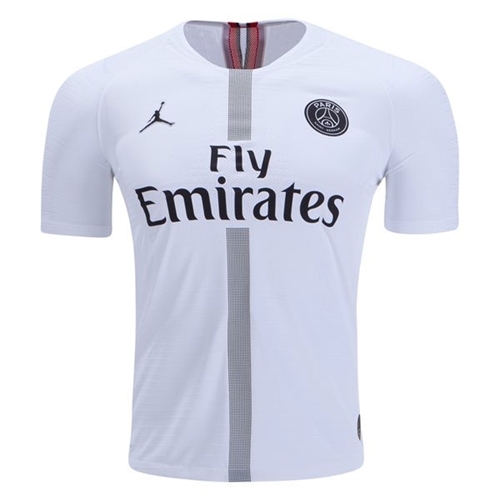 Featuring the jumpman logo with PSG designs, this jersey is the first of its kind. Basketball and soccer meet for the first time in this years PSG champions league jersey. It features proud team details and a complete cooling system for style and comfort.